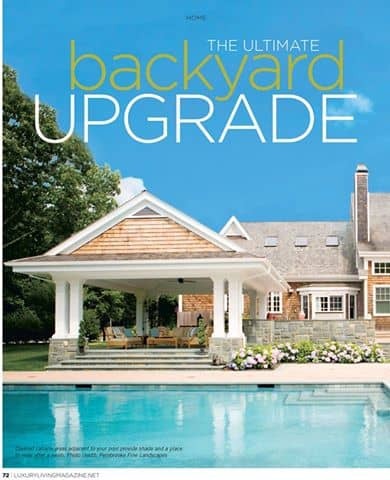 Green Island Design provides interview and project highlight photos for Newsday’s Featured ‘The Ultimate Backyard Upgrade’ article. What are the most important things to evaluate in your space before you start the poolhouse/cabana process? A Cabana or Pool House can be a life changing addition to someone’s home. Many times we use them as a focal point of the backyard to frame a pool or a patio which provides the homeowner with an architectural element as well as a very functional space. We are creating an outdoor area that is independent from the main house. When homeowners are spending a day at the pool, a Cabana or Pool House allows them to enjoy the outdoors by providing all the amenities their home provides without the need to retreat to the main house. 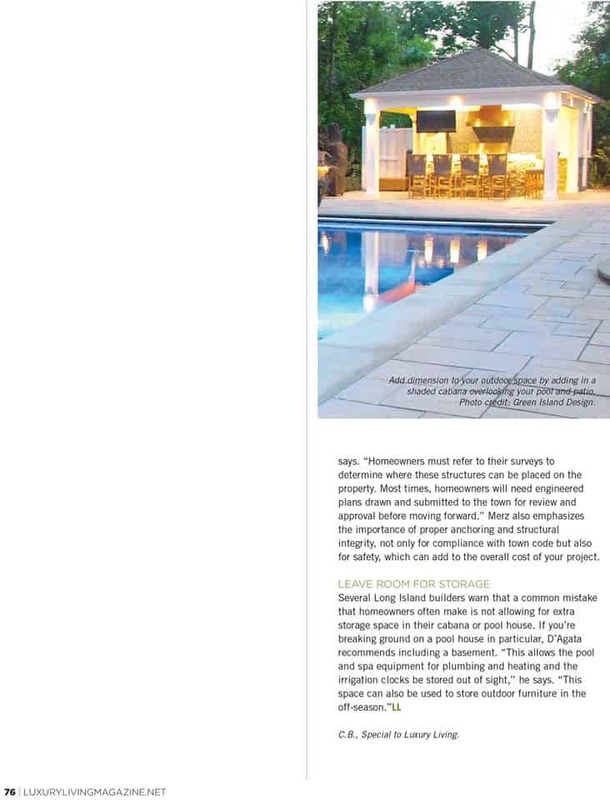 Each Cabana or Pool House can be customized to a homeowner’s lifestyle and needs. Whether it’s a place to change after a quick dip in the pool or a shady location to sip a cocktail, Cabanas and Pool Houses can be enjoyed on a daily basis throughout the year. There are a many things to evaluate when discussing a potential Cabana or Pool House with your landscape design professional. – Town Code: Cabanas or Pool Houses are considered structures and will need to comply with all setbacks and local town codes. Homeowners must refer to their surveys to determine where these structures can be placed on the property. Most times, homeowners will need engineered plans drawn and submitted to the town for review and approval before moving forward. – Planning: A well-developed landscape plan will encompass all elements of the backyard and provide the homeowner with a “road map” on how to sequence the construction process. Sequencing is a key element in any type of construction, especially on outdoor projects. 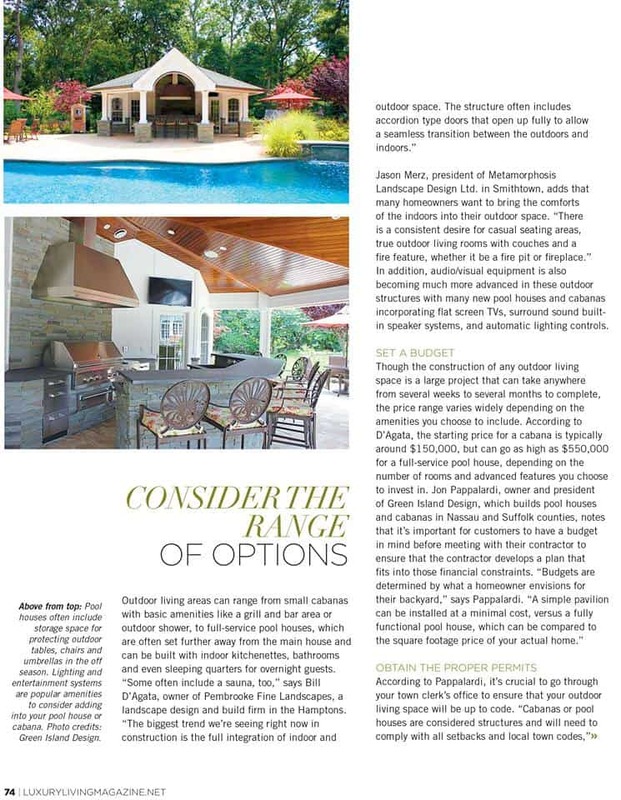 – Budget: Depending on the type of Cabana or Pool House, the budget will be determined by the homeowner. The plans can range from a very basic structure all the way to a design for the most high-end home. These details should be discussed during the planning stages with your design professional. A very common mistake homeowners make is not understanding the construction process associated with a Cabana or Pool House. Many times a homeowner will decide to wait until after their pool or backyard is complete, which can be a very smart decision based on numerous factors. Yet, it’s extremely important to think ahead and potentially install footings, septic systems, or run gas and electric lines out to the future structure. If planned correctly, this can save a homeowner a tremendous amount of money by minimizing damage to a finished backyard. What standard amenities are included in poolhouses and cabanas? Are you seeing any particular trends (design or structural) for this season? We are seeing a large increase in requests for Cabanas and Pool Houses. Homeowners are looking to spend more time outdoors with friends and family. 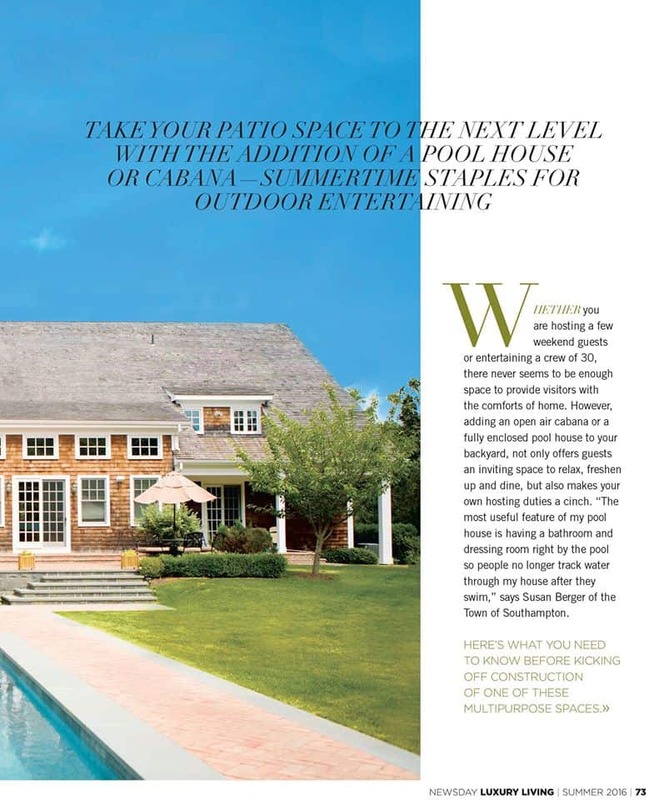 They are recognizing the value of not only a pool and a patio but creating a total outdoor environment. With the advent of new, durable and aesthetically pleasing building materials and products — including a wireless control system — these comforts are now able to be customized to a homeowner’s preference and budget. Financially, what is the range that these projects run? Budgets are determined by what a homeowner envisions for their backyard. A simple pavilion can be installed at a minimal cost versus a fully functional pool house that can be compared to the square footage price of your own home. The key is hiring a design professional who can explain as well as implement the process of Design to Build.